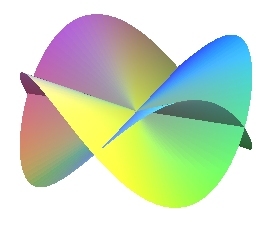 n =1/2 n =1/2, but the figure only shows the half-cone; the directrix is a Viviani curve, and this cone could be called Viviani cone. 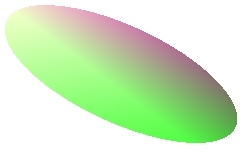 Cylindrical equation: (surface with rotation symmetry). 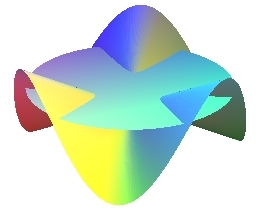 Algebraic surface when n is rational. 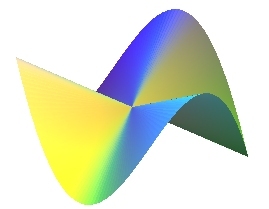 A sinusoidal cone is a cone a directrix of which is a sine wave cylinder (here ) and vertex the center of this curve. The section by a cylinder with axis Oz is the reunion of two sine wave cylinders (symmetric images of one another about O). 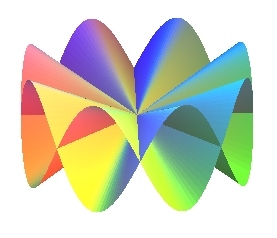 The section by a sphere centered on O is the reunion of two cylindric sine waves (symmetric images of one another about O). 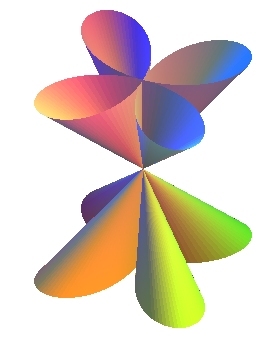 The section by a horizontal plane z = b is an epispiral: . We can also consider the secantoidal cone, with cylindrical equation , i.e. , for which the section by a horizontal plane is a rose: .